Retail displays, packaged goods, financial reports and apps all present readers with a dizzying array of data. Here are a few ways to make quick work of their long lists, tiny annotations, and mighty stacks of numbers. Type designers work with a diverse clientele, and yet common themes always seem to emerge in our conversations. This seems to be the season of complex typography, in which designers everywhere are faced with the challenge of presenting different and competing kinds of information to readers. An agency we’re working with is designing a demanding identity for a fast-moving consumer goods brand; an in-house art department is creating a responsive website for complex financial disclosures; a freelance graphic designer is doing the identity for a local coffeeshop, and discovering the joys and perils of digital menu boards. As always, the wrong fonts can lead designers into sticky dead ends, but the right ones can be immeasurably helpful. 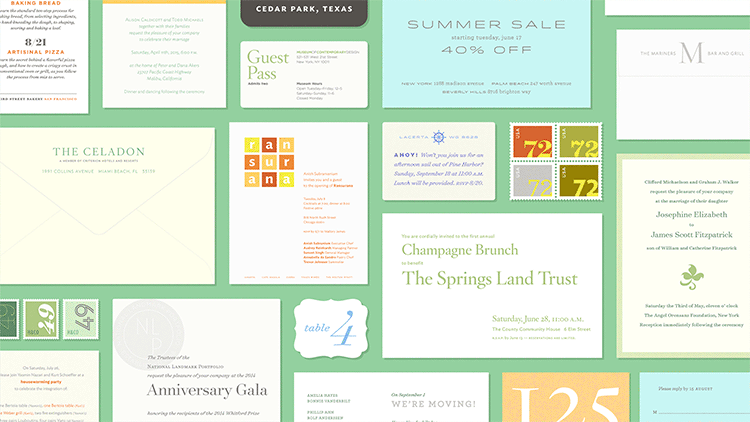 Here are some of the things our clients consider when faced with complex typography, and some of the typographic strategies that can be the quickest routes to success. Helpfully, there’s an adaptation designed for the web that proves useful in any medium: a typeface’s ScreenSmart fonts, which are designed to compensate for the effects of scale. Above, two compositions using the Whitney typeface, the one at the right substituting Whitney ScreenSmart for the tiny annotations below the graph. ScreenSmart fonts always deliver greater clarity and more comfortable reading at smaller-than-text sizes, making them a useful companion to a multipurpose typeface for setting the fine print. A non-designer’s first impulse is often to reach for a condensed typeface, on the principle that narrower letters take up less space. Yet it’s almost always a better option to make the counter-intuitive choice of a wider typeface, and to set the type in a smaller size with tighter leading. Wider letters have more comfortable proportions, they’re more generously spaced, and they have more ample counters, collectively making them the more legible choice. 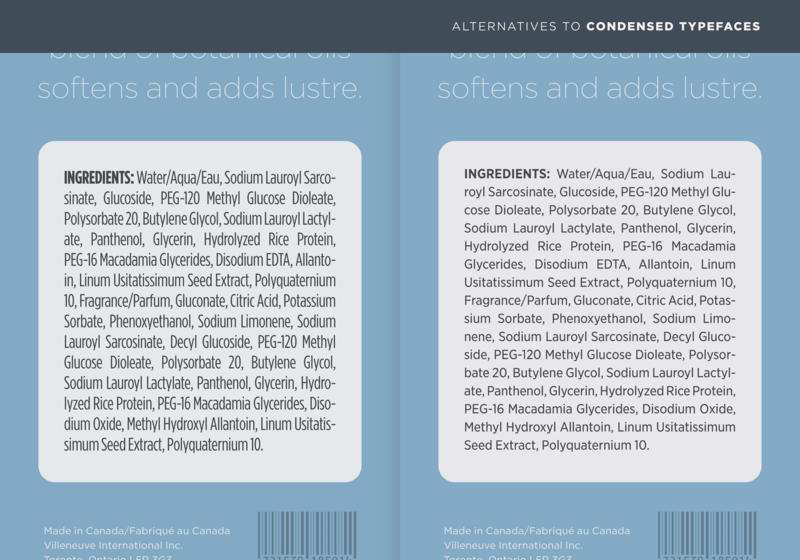 Above, two ingredient lists in Gotham: at left the passable Gotham Condensed, but at right the far more inviting Gotham Narrow, a family that’s two steps wider. TIP: Use not only a wider font, but a wider ScreenSmart font as well, for maximum clarity. Superscripts are included in every H&Co font that has a Pro edition, as well as Gotham, Ringside, and Inkwell. 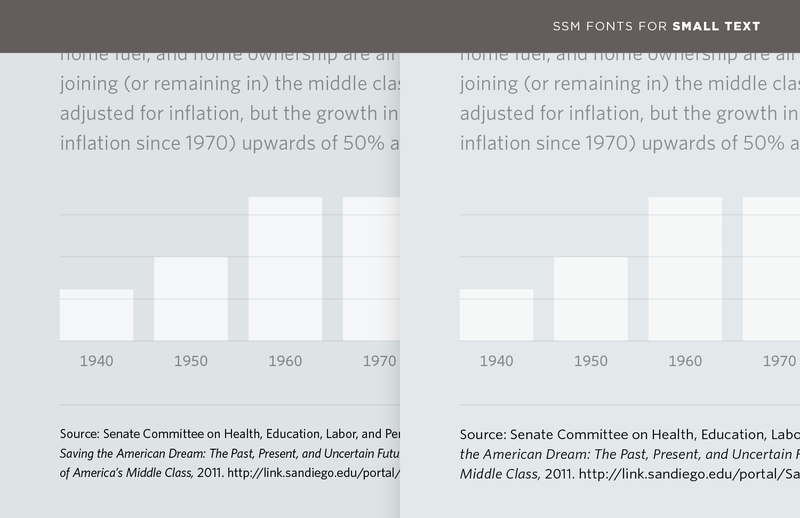 TIP: In the text, mark your footnotes with superscripts, which ascend above the cap height. But in the notes themselves, use numerators instead, which are lower on the body. This connects them more clearly with the explanations that follow, and gives them greater clearance from the preceding lines. The same Pro packages that contain superscripts and numerators contain tabular figures, the most vital part of any composition that includes numbers. 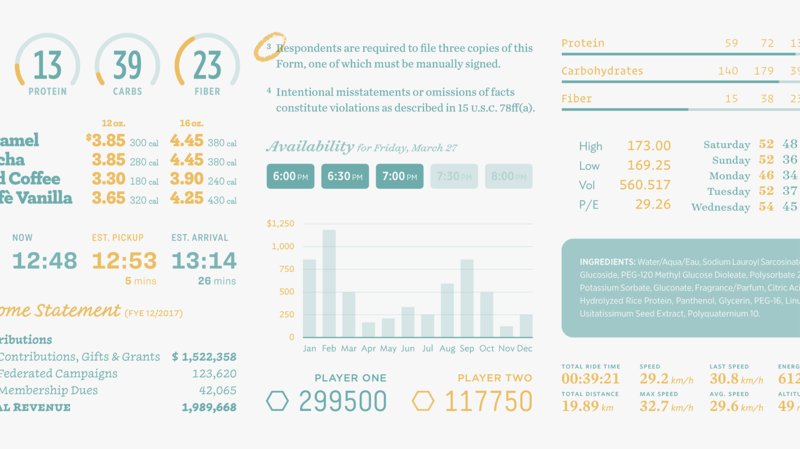 Unlike a font’s traditional proportional figures, whose widths vary with the natural shape of each number — from a narrow 1 to a wide 0 — tabular figures are all built on the same horizontal measure, ensuring that columns of data always align correctly. 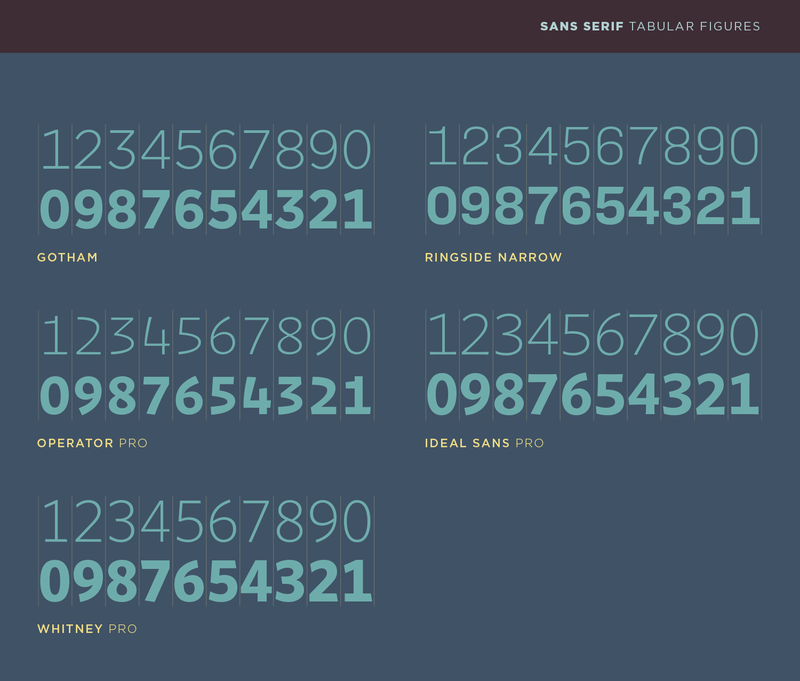 Tabular figures have a second and equally important characteristic: they maintain their equal widths across a range of weights. (This runs counter to the typical behavior in a typeface, in which heavier weights become progressively wider.) Known as “duplexing,” this is one of the essential characteristics of tabular figures, because it allows designers to highlight individual lines in boldface without disrupting the width of the column. TIP: The word “tabular” may imply the dense tables that are annexed to annual reports and financial disclosures, but don’t forget how often stacks of numbers appear in other contexts. 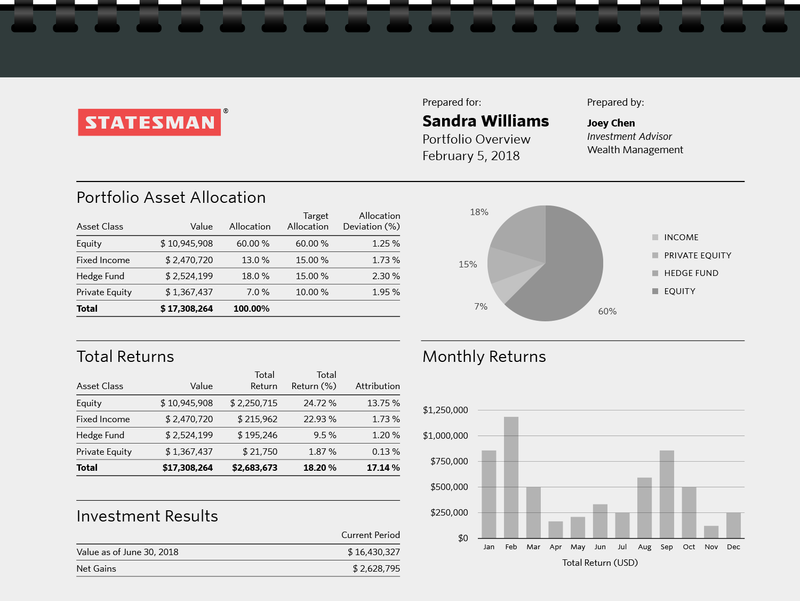 Tabular figures are essential in menus, indexes, and directories, and anywhere that a design includes prices, statistics, account numbers, or scores — or any kind of dynamic data online. Any digital experience that shows changing numbers such as stock prices, sports scores, product skus, exchange rates, flight numbers, timetables, or membership points will absolutely demand tabular figures. Design your projects with tabular figures from the outset. 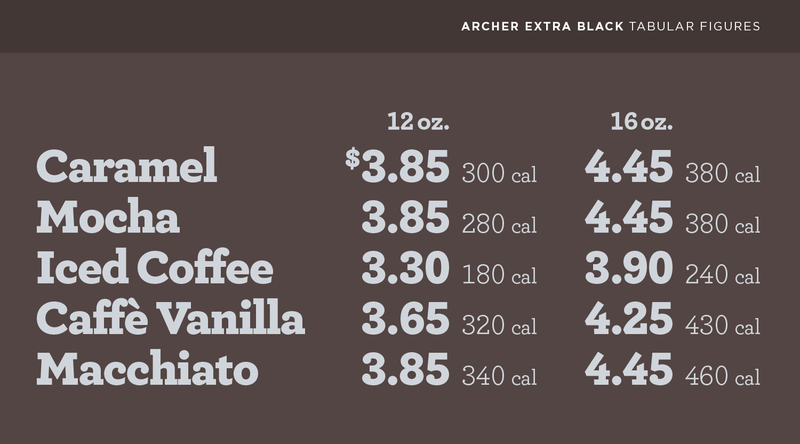 TIP: If your tables will use only a single weight, consider a typeface whose numbers have equal widths without the regular-and-bold duplexing of true tabular figures. The Indicia, Claimcheck, Revenue and Greenback typefaces in our Numbers collection are designed on a fixed width, as are the cheeky digits in each weight of Inkwell Blackletter. The last mile of visual communications are often the things created not by designers, but by software. It’s frequently the operators of word processors, spreadsheets, and presentation packages who need to speak in the organization’s voice, but lack the tools to do so properly. 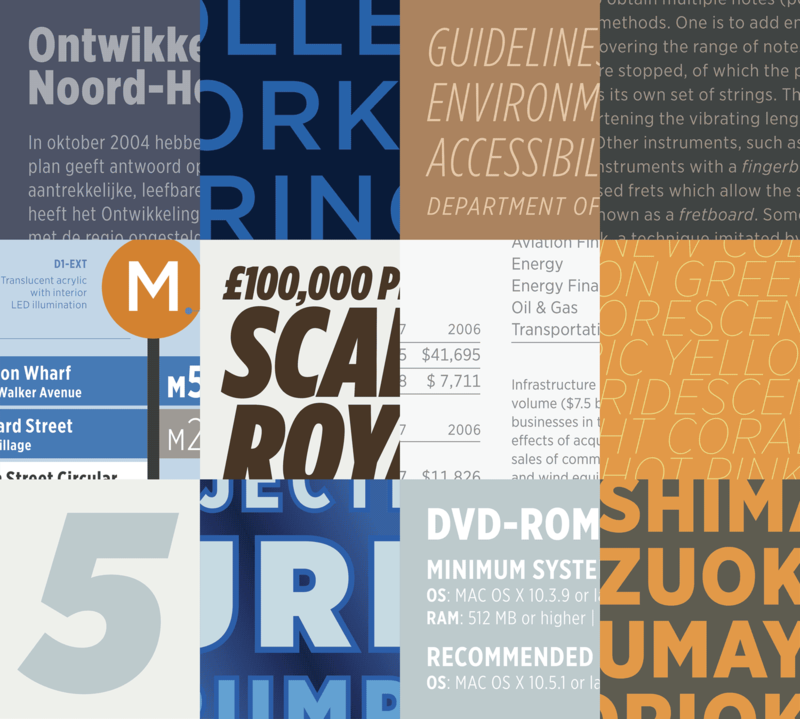 For these projects, we’ve created Office Fonts. Annual reports offer designers a marvelous opportunity to strut their stuff. In the hands of a thoughtful typographer, a dense volume of technical text can become warm and welcoming, its changing rhythm of introductions, statements, analyses, and disclosures calling for a beautiful typographic system to help organize the text. 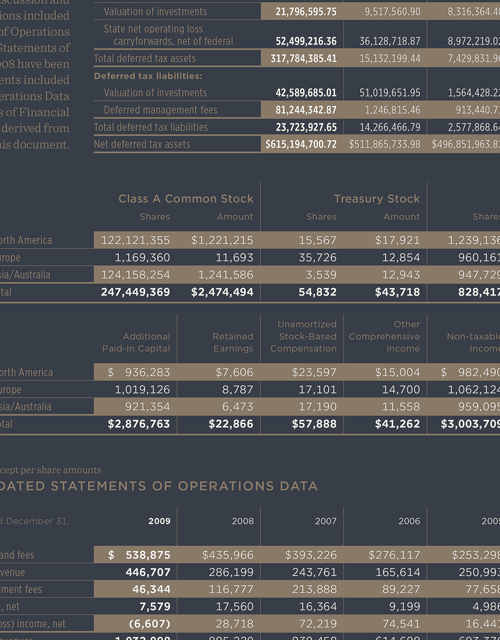 Financial data can be uniquely satisfying to design, offering an irresistible opportunity to work with large type families in intricate ways. There are tables both long and short, as well as charts, graphs, and diagrams, all studded with headings, footnotes, and legends that defy even the most ingenious grid. Each of these details places a special burden on the fonts, making it especially important to choose the right palette up front. 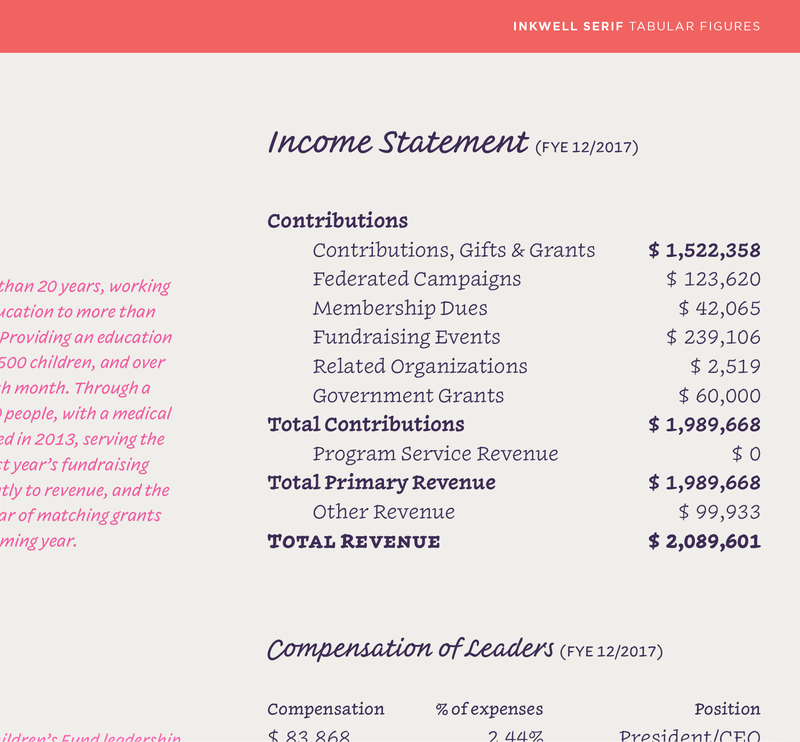 We’ve gathered some thoughts about choosing fonts for annual reports for our Techniques library, here you’ll find four things to think about when considering a typeface — and a collection of font families specifically designed to meet these unique challenges. 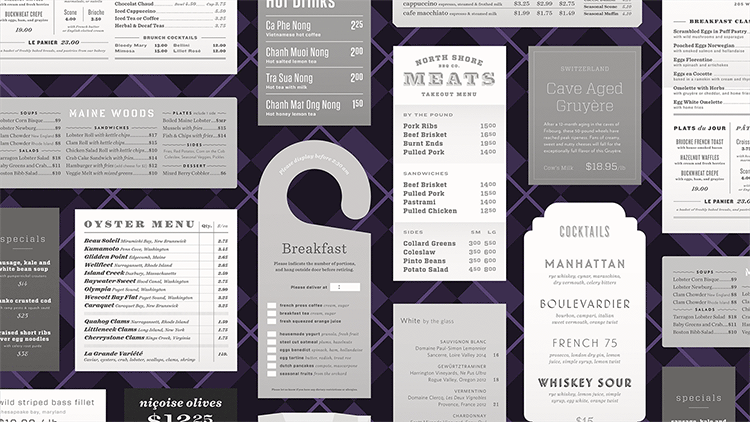 With the arrival of a new year comes a new Zagat Survey, and with this year’s edition comes a special typographic surprise: a complete redesign using our Whitney family. 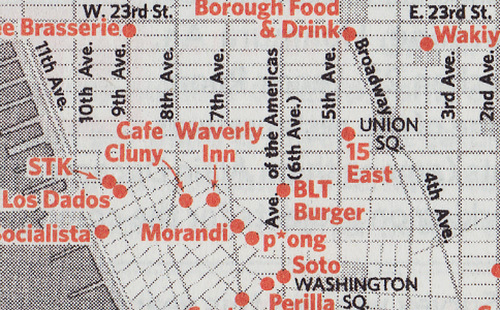 The indomitable Zagat team has given the fonts one of their most rigorous workouts ever, using Whitney’s many special features to excellent advantage — here’s some of what’s inside. 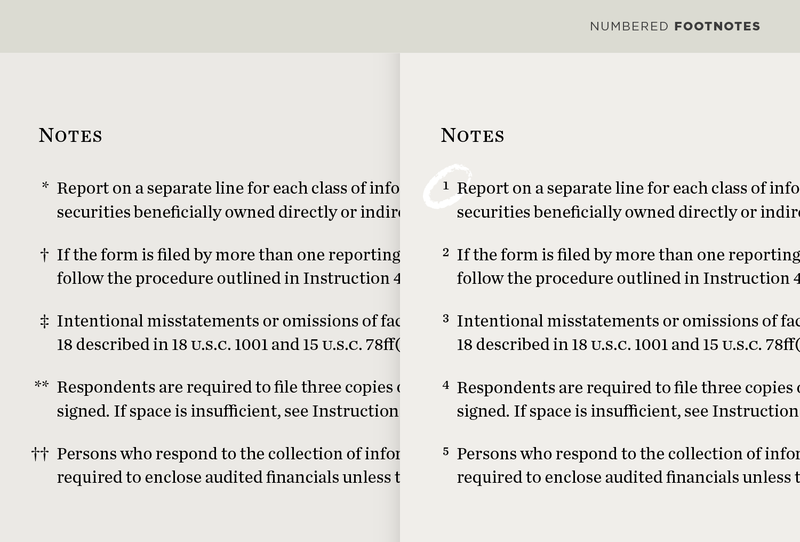 Pocket guides have an especially compelling need to keep page count low and legibility high, making Whitney’s compact forms a good match for the project. In its pro edition, Whitney contains a set of even-width tabular figures, which the Zagat team used for this very clear and sensible wine vintage chart, above. 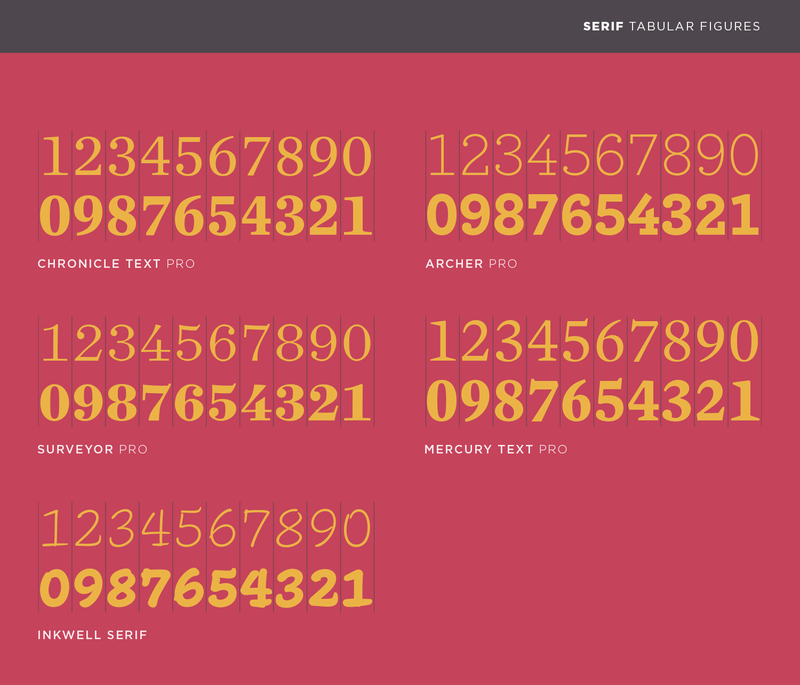 More fonts for tables, maps, and newsprint.